Isaac Babel was the most prominent Jewish Soviet writer of the 1920s and 1930s. That made him a logical choice to be the face of the Popular Front and a lead-pipe cinch to be subsequently swept up in the Stalinist Purges. Yet, decades later, questions still persist regarding his final years in an NKVD prison and the fate of his large archive of unpublished works. When the great writer’s grandson retraces his footsteps, he finds the new Russia has not changed so very much from Soviet times in David Novack’s Finding Babel (trailer here), which opens this Friday in New York. During his own lifetime, Babel was internationally acclaimed for Odessa Tales and Red Cavalry, but the latter’s often brutal depiction of the Red forces earned him suspicion within the Party’s upper echelon. However, he was “useful” for a while, which is why he was allowed to function as a sort of literary ambassador for the USSR in Paris. However, the radically honest criticisms of post-revolutionary Soviet society in his play Maria probably sealed his fate. Andrei Malaev-Babel’s pilgrimage in search of his grandfather’s legacy stops in Paris, where the actor-drama teacher advises a new production of Maria. 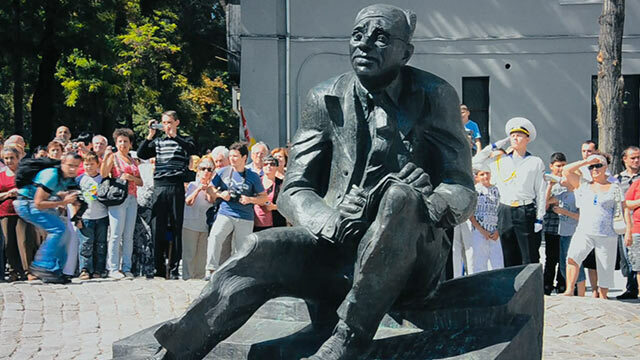 He also takes us to Ukraine, where the Odessa-born Babel is celebrated by average citizens and high ranking government officials alike as a national hero. This might be a good time to point out Putin’s propaganda machine is trying to make this nation synonymous with anti-Semitic nationalism. Eventually, Malaev-Babel visits the Russian artist colony where his grandfather was arrested. Although he has a pleasant visit with family friend Yevgeny Yevtushenko, the trip turns sour when Malaev-Babel tries to visit the site of his grandfather’s arrest. It seems that historic site now lies beyond the steel gates of a shadowy compound, the owner of which has no reluctance to unleash his thugs on Maleav-Babel and the film crew. We very definitely get that sinking feeling of “the more things change . . .” throughout Finding Babel, especially when the grandson makes a formal request to see his grandfather’s KGB/NKVD files. Fortunately, investigative journalist Vitaly Shentalinsky gives him a good idea of what to expect and strategies to circumvent obstructions. Frankly, Shentalinsky could probably be a fascinating subject of his own documentary. The same is probably true of Brother Victor. Unlike so many in the Church hierarchy, the free-thinking monk openly equates the new regime with that of the Communist era. Of course, he has a unique vantage point at St. Catherine’s Monastery, the former site of Sukhanovo Prison, where Babel was tortured. 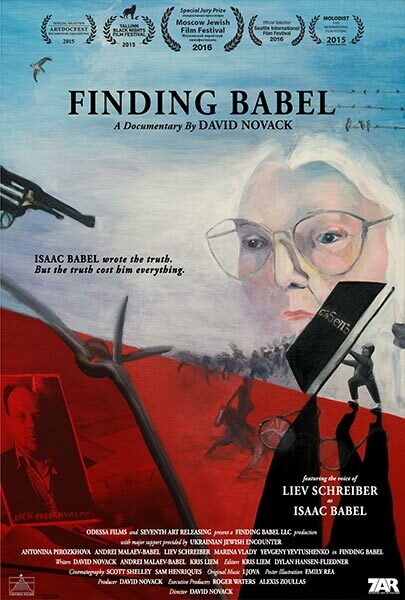 Throughout Finding Babel, Liev Schrieber reads excerpts of Babel’s writings in his best PBS voice. He brings out the poetry of Babel’s prose, which definitely helps put him in literary perspective. Novack adds further color with vintage black-and-white film clips of Yuri Shumsky playing Benya Krik, the Jewish gangster anti-hero of Odessa Tales in Vladimir Vilner’s 1926 Russian film. Clearly, Novack (who also produced N.C. Heikin’s outstanding Kimjongilia) is aware how the evil legacy of Soviet Communism continues to reverberate in modern day Russia and Ukraine. He tries not to beat us over the head with parallels, but sometimes the Russians will do it for him. Yet, he never neglects Babel’s place in cultural, socio-political, and family history. It is a film of great sensitivity and rather unfortunately, significant modern relevancy. Highly recommended for anyone interested Ukrainian and Russian history and literature, Finding Babel opens this Friday (10/28) in New York, at the Cinema Village.